Hello and welcome to the 173rd instalment of the SWD. Syrian Democratic Forces liberated Karim neighbourhood located in western Raqqa city after clashes with ISIS. As a consequence of the heavy losses from ISIS SVBIEDs and suicide vehicles, the Syrian Democratic Forces have begun to build up vehicle barricades like Iraqi Forces did in the Battle of Mosul. Last blitz attacks launched by ISIS managed to kill, at least, 45 SDF soldiers in few days. In addition, according to the US Special Presidential Envoy for the Global Coalition to Counter the Islamic State of Iraq and the Levant Brett H. McGurk, there around 2000 ISIS fighters in Raqqa city. Meanwhile, the SDF liberated 23 ISIS suspects a request of the Raqqa tribal elders. The SAA Tiger Forces have liberated 5 new villages, Hardan, Makleh Sagira, Makhleh Kabira, Atshaneh, south of Fourat River. 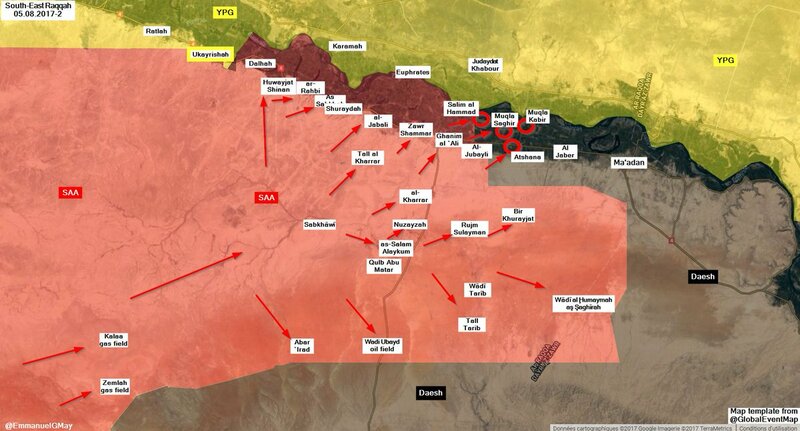 If true, these advances would mean that, as said a few days ago, the SAA would have reached the Raqqa-Deir ez-Zor limit from the Euphrates side. The Syrian Democratic Forces stationed in the Afrin area had blown up a military vehicle belonging to Turkish-backed FSA who attempted to advance on the SDF-held town of Ayn Daqnah during clashes. The Afrin – Aleppo road has been reopened after few days closed. The SAA forces had intensely bombarded with artillery shells and GRAD rockets the villages of Hawash, Beit Ras al-Ras, Hawija, al-Hawiz, and the outskirts of Qalaat al-Madiq in the al-Ghab plain west of Hama. This attack possibly comes as a response to yesterday’s HTS’ attempt to attack government positions in Maan. Meanwhile, Russian military police units arrived in Deir al-Fardis, located in southern Hama, to monitor the Northern Homs de-escalation zones. The SAA managed to steadily advance over As Sukhnah city during the day. 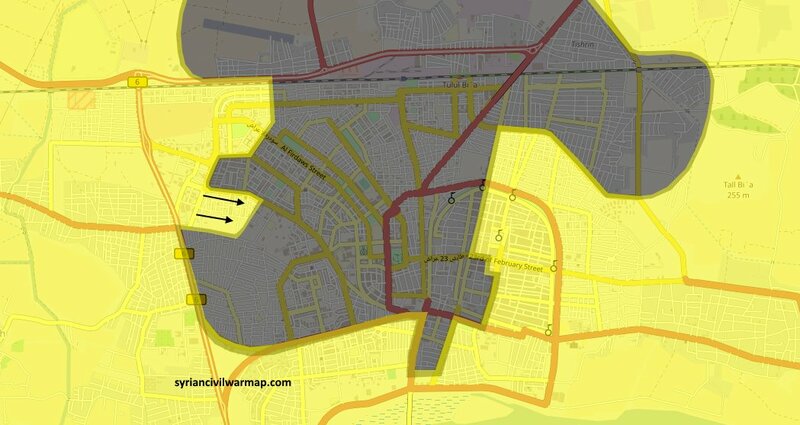 Last reports suggest that the city has already been liberated from ISIS forces. Government forces managed to besiege the city from the northwestern side and the southeastern side by capturing the western entrance, the Jabal Tuntur and Dawahikiyah Cave. 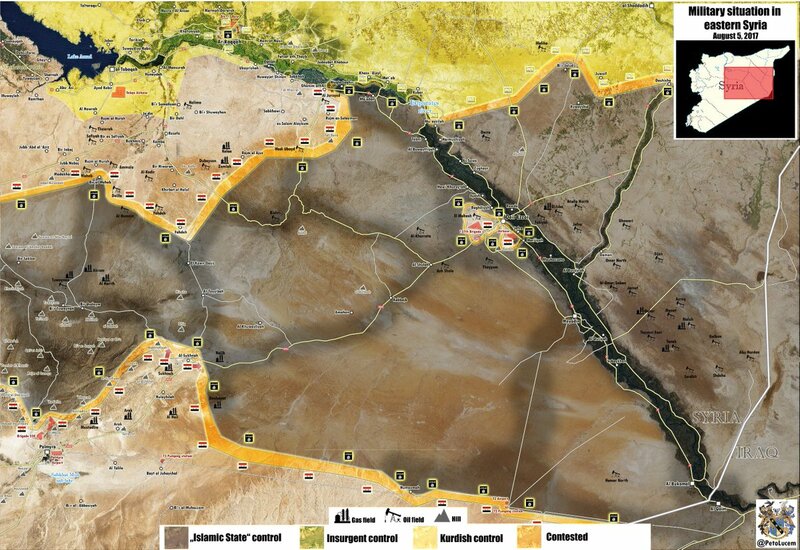 Thus, the fact that Sukhnah has been captured by SAA forces implies that the Islamic State has lost its last stronghold of the road to reach the besieged city of Deir ez-Zor. Now the terrain turns in favour of the forces with strong air superiority, in this case, government forces, as the terrain is mostly plain without mountains -something similar as can be found in the Itria-Aleppo road. Unconfirmed reports suggest that Muhanad Talaa, the former commander of the New Syrian Army, has rejoined the Syrian Arab Army and is in the Deir ez-Zor operation. Several tunnels were blown up by the Syrian Republican Guard units in Jobar and Ayn Tarma front lines. Shortly after, the SAA launched a ground attack while supported by multiple Russian Air Force strikes and artillery. Government forces managed to capture Sunbul Gas station. Although unknown, a large number of civilians and militants from both sides can be expected to be known within the following days. Russian troops have been deployed all over the Syrian-Israel border as can be seen on the following infographic. The Free Syrian Army units of Jaish Asoud Al-Shariqia and Ahmad al-Aydu forces control Bir al-Shaab in the eastern Swaida area after defeating the Syrian forces stationed there. On the government side, SAA forces, the Palestinian Liberation Army, the SSNP and other allies captured Tal Asadi northeast of al Zulf dam and Tal al Dabi’a. According to the SSNP media centre, the SAA and its allies have captured Tal Riyahi near the Jordanian border. On the 4th of August 2017, CJTF-OIR has conducted four strikes in Syria. CJTF-OIR‘s main focus in Syria is Al Shadaddi region where they did two strikes against IS destroying two mortar position. Other areas where seven strikes occurred are Abu Kamal and Deir ez-Zor, destroying four oil stills, and an ISIS headquarters. The full report on CJTF-OIR strikes conducted in both Syria & Iraq can be found here.